“Nourishing” is one of those words that always makes me cringe. It’s a perfectly fine word, mind you, but it’s so overused in the world of marketing, as to lose any real meaning. I mean few words so succinctly call up the notion of mom, love, food and warmth in such a glib and facile manner. Now I’ve got nothing against milkshakes and ice cream and candy and other foods of little-or-no nutritional value. In moderation, anything is fine. It’s just that by calling them “nourishing blends” Starbucks is giving the overweight tacit permission to indulge in something that’s not all that healthy for them. 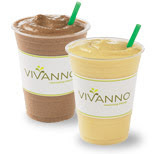 I mean it’s pretty easy to see people sucking down two or three of these a day because they’re “nourishing” versus the Frappuccino, which is clearly a coffee-infused milkshake. Which is more of a problem for Starbucks than most other marketers. You see Starbucks built their reputation on being a kind-to-employees, community-minded, social activist company. The kind of place where, when they told you the coffee came from small farms and the profits from the water were going into some sort of fund, you believed them. The sort of place that wouldn't call a sugar-laden milkshake "nourishing." This is just a bad move for them, albeit one that could have been avoided by a slight change in marketing tactics.